Comrades! In light of what has become Americans' universal worship of the socialist philosophy so ably advocated by Alexandria Ocazio-Cortez and Bernie Sanders and so sincerely (though often ineptly) imitated by the panoply of candidates seeking to become the Democrat nominee to run for President in 2020, it's especially important to celebrate "Socialism's Historic Destiny" in honor of The People's Cube's birthday fourteen years ago on April 1, 2005. 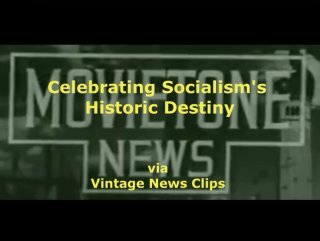 To honor The People's Cube's diligent and excellent portrayal of "Socialism's Historic Destiny," I have produced a historic documentary titled "Celebrating Socialism's Historic Destiny." (Scroll further down to view my documentary.) I concede it's probably too lengthy (31 minutes) to hold the attention of Millennials, but that doesn't matter because they're already in love with socialism (but see footnote * below). 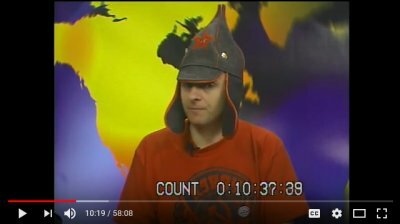 This historic documentary is for the hard-core, loyal Comrades who toil in The People's Gulags to serve the Greater Purpose of The People's Cube. Such comrades' loyalty to the Historic Destiny of Socialism enables them to endure the lengthy nature of the documentary in the same way in which citizens of Cuba have always lovingly endured the admittedly lengthy speeches given to The People by our Dearly Departed Comandante Fidel Castro. Like all loyal Comrades, we measure our loyalty by the severity of the soreness of our hands and arms from clapping during the necessarily lengthy speeches of our leaders educating us about Socialism's Historic Destiny. Unfortunately for me, my being forced to wear a straight-jacket (due to my tendency to often stray from Party Wisdom) prevented me from enjoying making my hands and arms sore, but I assure all Comrades that watching my documentary makes me want to clap non-stop. Fortunately for us, our own Supreme Leader, Red Square, is so firmly ensconced in the Dialectics of Socialism's Historic Destiny that he need not clap at all. Rather, he should always be the clapee rather than the clappor (Or is it "clapper" like that former DNS Director on CNN? Clapper is, of course, tied for the position for "Master Clappingist" with that former CIA Director on CNN). 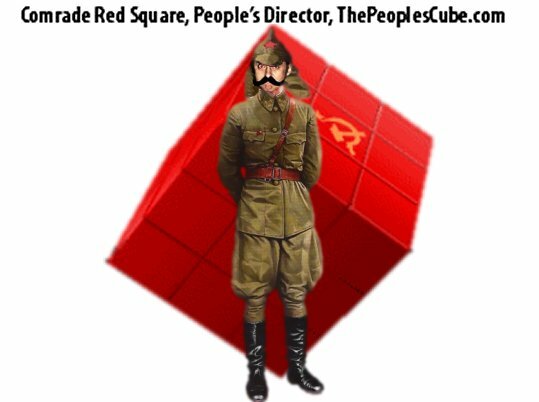 Regardless of who may be the greatest clappor (or clapper), there can be no doubt that Red Square always occupies the position of greatest clapee who therefore never has a duty to be a clappor (or clapper). I can't clap but for a different reason. Under the Disabilities Act, my being in a straight-jacket relieves me of the duty to clap, so I just cheer instead (but some mistake my cheering for yelling and screaming). Like Dave Barry, I am not making this up. I'm getting a headache, so I'll stop here. Here's the video. Watch it, or else. *We know a sizeable majority of Millennials already love socialism but without really understanding why. It's like "love at first sight." Their at-first-sight love of socialism doesn't give them knowledge of everything we all know about socialism that gives it it's "Historic Destiny." History has taught us that love-at-first-sight marriages too often deteriorate into hate-at-last-sight divorces. Thus, it's imperative for those of us who already understand socialism's Historic Destiny to somehow figure-out how to motivate Millennials who love socialism at first sight to spend the time necessary to learn the wealth of truth serving as the solid foundation for Socialism's Historic Destiny. The floor is open for discussion, Comrades. ... I'll stop here. Here's the video. Watch it, or else. A fine overview, the recent 74 years... and that newsreel-voiceover of yore! - with a note of suspense and characteristically thunderous. Priceless! @3:52 (1:30) Stakhanovian workers of cała klasa robotnicza [all the workers kollektive] do over-norm w dniach pracy stalinowskiej [during Days-of-Working-for-Stalin] in Zakłady imienia Stalina [plant named 'Stalin', 'Stalin'-factory], when in warta stalinowska [workshift-for-Stalin] ; 111 procent normy .. 125 procent normy, ... ; (summary:) by working over-norm, the workers złoźyli najpiękniejszy dar robotniczy dla Wodza i Nauczyciela Mas Pracujących [presented the most beautiful gift to the Leader and Teacher of Working Masses]. @6:32 (2:00) Warsaw, folkloristic groups* perform (for Stalin, of course), and sample: villagers from Białowieża (BTW: Białowieża, in north-eastern Poland, is the unique spot where the European bison survived, and was in the 50s carefully restituted in the Białowieża Forest) presents piosenka radziecka o Komsomolcach [Russian song about Komsomoltsy]. * it's that (somewhat odd) sovieto-socialistic big-gov-promoted "folklore" ; it was cultivated in all Soviet Bloc corners. The expressive means of the "Kronika" altered here, of course: gravitas, solemnity, and overvoice turned this time elegiac. (the (m:ss) here mean (@ m:ss))_ "elegiac PKF-Polish translated"
[Melpomene→](9:36) "Great Stalin .. March 5th, at 9:50 p.m., the heart - stopped its beat - Yosif.. Vissarionovich.. Stalin.."_ ... (scenes of mourning in Poland follow) ... "
Genosse Dummkopf - since you so like black & white post-war Polish films, may I suggest the latest black & white post-war Polish film, Cold War? I just watched it and I can't praise it highly enough, especially with the angle of what socialism does to the arts. I thank you for your praise and agree with your alternate-history speculations -- I'm working on a time-machine to send Oleg back to Ukraine circa 1900 with a one-way train ticket to Moscow so he can warn Rasputin to track down Lenin and give him the ice-pick treatment, save the Czar, who would then out of gratitude appoint him Foreign Minister and Minister of Economics. No doubt Russia would have become an economic powerhouse, would have initially fought and defeated, rather than making a treaty with, Hitler, and thereby become a permanent friend of the West. 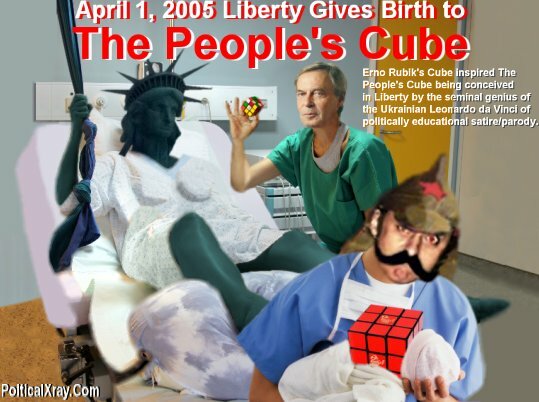 Then Oleg would have retired to Ukraine and invented Oleg's Cube. By the way, in the second video you posted, I recognized the "Birthday Cake" building (for Stalin) in Warsaw from my visit there in 2005. Of course, in your different time-line speculation, it would have been a building constructed by the Czar's son to honor Oleg, the Architect of Modern Russia, and Oleg probably would have demanded a different architect for that building. Later, apart from the horror of the concentration camp, visiting the city of Krakow was quite enjoyable. To my wife's dismay, she was unable to find records of her paternal grandparents (in Krakow), who never met (eve though they grew up within a few miles of each other near Krakow) until they immigrated to the U.S. before WWII. By the way, I'm sure the Central Committee will have a special reward for you for your having endured the 31 minute video. Oh yep, the Cherry, nay, the Cake on Poland's Capital. 1951/1952, Batyushka to "The Fraternal* Polish Nation": It's an offer you can't refuse. Right Korrekt from the start, and the thingamajig yet in blueprint only, Poles already dubbed it: "Sen szalonego cukiernika", the "Phantasm of a mad-gone candymaker". bbut.. bbut.. Komrade KOOK, it's Moscow, the Lomonosov University (built 1949-1953). And yet, esteemed Komrade, you are fully korrekt, as Candymaker's Phantasm is (consciously) a near copy of Lomonosov, only the "icings on the cake" kinda polonized. And both palazzos were pressed, quasi-successively, out of the socrealistic mind of one and the same Soviet architect. Komrade KOOK, you are a tochka nanometers away from grabbing the prize for solving the "where is this? he who knows is a genius !" puzzle! (GOTO here and SCROLLDOWNTO (or text-search for) : "breasts swollen with pride ! - socrealism !"). aaand... YESSSSS! Vee haf ze WINNER!!! Komrade KOOK!!!!! ba-dumm ching! ba-dumm ching!! ba-dumm ching!!! Komrade KOOK, in case you are a bigly incredible fan of Nightmarish Architecture / Soviet Edition, I honestly - and most humbly - recommend you a glimpse into these two consecutive Kubic posts: this one and that one. (2:10) by tram (& beautiful Chopin continued) from Kraków to Nowa Huta - "the darling of our architecture .. 30.000 indwellers, the first socialistic city in People's [sic!] Poland". The latter was hideous. Nowa Huta - New Ironworks. Big blast furnace, but... no rolling mill. Produced steel was cooled, transported to Bulgaria - here melted again, and rolled into sheets, rails, etc. (Bulgaria got a Soviet-built rolling mill, but ...no furnace). Equal distribution of toil, you see. And jobs, jobs, jobs. Indeed, it was doubleplus hideous. Kraków - since ever (and to this day) Poland's cultural "capital". And Nowa Huta (which, of course, drew young masses from rural regions) was meant, among others, to proletarize that stronghold of bourgeoisie. Trivia: Nowa Huta was the single city in Poland with a mostestly korrekt, Soviet-style Lenin-pointing-Next-Tuesday monument right in the central square. Needless to say, this Vladimir endured "people's enhancements": thrown paint (and feces), written adorations (which I shudder to cite), and even a true bombing (kulaks!). Here yet another view on Mad Phantasm and its vicinity, the yuugely oversized Plac Defilad. Comrade! The 2 seconds (@7:10) are a must! Remember: "breasts-n-pride", the puzzle! (9:46) From 1991, a compilation: Stalin's Palace, in time. From 1951 (preparations), '52-'55 construction (Stalin's death in-between), '55 opening (and dancing with comrades of the Central Committee (GenSec: Bierut) - enthusiasm). (@9:17) in '90 - PZPR, the Polish commie-Party, dissolves. First, I must commend you for having exhibited the sheer willpower and attention span to have watched the "Celebration of Socialism's Historic Destiny," which, without doubt is the longest video created especially for TPC. No doubt you richly deserve the Marx/Lenin/Stalin Persistence Medal. Second, I enviously confess that your lack-of-brevity almost equals mine. So much so that I'm now looking over my shoulder as I write these words. Fourth, regarding "swollen breasts" in the context of architecture incorporating sculptures, my expertise in Soviet-Style architecture is quite limited -- or one may say -- somewhat selective as you will observe from this post: http://polisat.com/Putin-Manhandle-Disp ... -Women.htm . Needless to say, I greatly appreciate your posts and comments regarding my record-breakingly long video tribute to TPC. Now I must get back to my joyous task of trying to decipher IRS regulations with which I am obliged to comply on or before April 15, our annual day of Joyous Giving. 1956, Nikita, secret speech, wherein (pointedly leaked): Great Stalin declared... a monster. As for Mad Candymaker's Phantasm - officially Pałac Kultury i Nauki imienia Józefa Stalina (Joseph Stalin Palace of Culture and Science) -, that "imienia Józefa Stalina" part was purged. Not only from naming, but also in stone (portal, main lobby, and book). Later, some shrewd kulak added the hewn-in-stone ORWELL (which itself got subsequently purged). da nichyevo, Komrade KOOK, never mind: it's just standard heroism of any glowing Kubist. And, as they say: It requires only ze vill to do so. You know - ideas galloping, overuse of keyboard electrons, and... Global Warming the result! Lest an angry multi-gendered pay-gap high-woke proletariat revolutionizes your kooky palazzo! Komrade KOOK, there's really not that much to decipher. Just take all the money you possess and fling it as high into the air as you can. What falls to the ground belongs to the government, what doesn't, you get to keep. And I agree, Komrade G.D. is quite special. O yeah... I can feel your pain hear your howls, incoming across Bolshaya Voda, ze Big Pond. April 15th, and 24 hours later: your Tax Freedom Day. Wait - whad? April 16th, and - Tax Free?? already done??? Commusarka Chiquita Ocasio-Guevara will teach you a lesson, you burzhui malcontents! She will show you what Democrautoritarian Socialictatorship is!! FORWARD!!! Chiquita is the boss! cash her ousside, howbow dah? eh? I followed your suggestion. I only have a few meager coins. I threw them into the air, and they all fell to the ground. Then just as I was trying to sweep them into an envelope to be sent to the IRS, an IRS street-sweeper swept them up. Doesn't it just make you proud to see government efficiency working as hard as a one armed paper hanger to collect our money almost before it hits the ground. If any other Cubist needs assistance calculating their 'Day of Giving' amount, just give Clara a call at BR5-49 because I'm always happy to help.